Many books, magazine articles, and news stories these days remind us of the significance of pollinators in our lives. Not only do they pollinate the flowers of our agricultural crops, such as pumpkins, berries, apples, cotton, and flax, allowing them to produce seeds or fruit, they also support other wildlife. The fruits they help produce can be a large part of the diet of mammals and birds, and numerous animals in the food web consume the insects themselves. For example, 90% of birds rely on the caterpillars of butterflies and moths to feed their young. 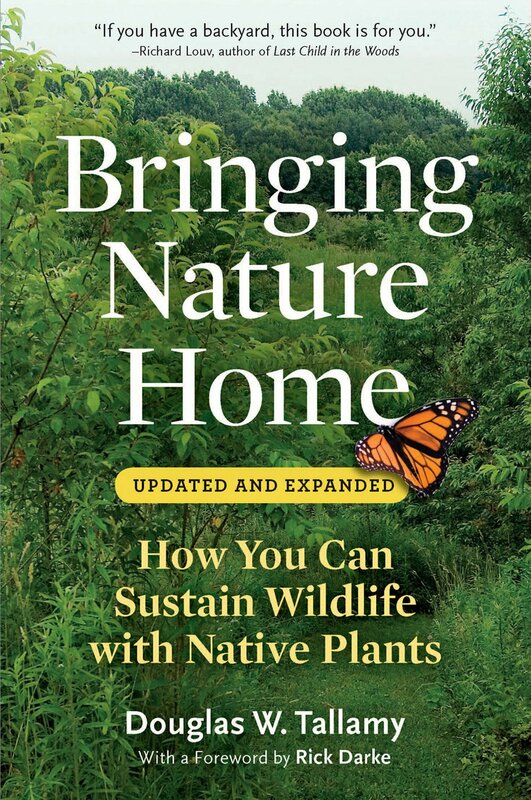 We also hear from wildlife ecologists like Dr. Doug Tallamy, author of Bringing Nature Home, about the importance of providing habitat for these insects in our own yards as natural fields, wetlands, and forest areas have been greatly reduced. Homeowners with small yards or apartment dwellers with balconies may wonder what role they can play in supporting pollinators. The good news is that by selecting smaller sizes of woody plants and making creative use of containers, gardeners with limited space can enjoy appealing landscapes that attract a wide variety of these creatures. Before deciding what plants to select, gardeners should know which of the pollinators they hope to draw. While Lepidoptera (butterflies, skippers, and moths), including the endangered Monarch, are the most eye-catching of the pollinators, they are not the best at pollination because their bodies have little direct contact with the flowers. Native bees – there are 400 species in Maryland and Virginia – are the best pollinators as they travel from flower to flower seeking nectar for themselves and pollen to feed their young. Syrphid flies, whose young are a biological control for aphids, are the second most efficient pollinators. Beetles were the earliest pollinators of flowering plants, and remain important pollinators of ancient species such as magnolia (Magnolia virginiana) and spicebush (Lindera benzoin). Hummingbirds can also spread the pollen that lands on their heads as they hover to drink nectar from tubular flowers. Hummingbirds can also spread pollen as they sip floral nectar. Photo © Elaine Mills. The plants that provide the best support for pollinators are native species that have co-evolved with these animals. They are recognized and accepted by local fauna as food and shelter and are also likely to do well in the garden because they have adapted to local climate conditions. Gardeners in small spaces won’t be able to use tall canopy-layer trees of 40 to 100 feet, but they can choose understory trees, shrubs, and perennials, including herbaceous plants, grasses and sedges. Several examples of appropriate native understory trees are Amelanchier arborea (downy serviceberry), Cercis canadensis (eastern redbud), and Carpinus caroliniana (American hornbeam). Serviceberry has all-season interest, its flowers attract native bees, and it serves as the larval host for butterflies and moths. A shorter 10- to 12-foot cultivar of eastern redbud, ‘Little Woody,’ can serve as a nectar source for both insects and early-season butterflies. Hornbeam does well in urban sites while serving as a larval and nectar source for many butterflies. Amelanchier arborea is a small native understory tree that is appropriate for small-space gardens. Smaller cultivars of native shrubs, such as Ilex glabra ‘Shamrock’ (inkberry) and Itea virginica ‘Little Henry’ (Virginia sweetspire) at 3 to 5 feet and 18 to 24 inches respectively, can be good options for smaller gardens. Evergreen inkberry is a good alternative to finicky boxwood and provides nectar for bees and butterflies and fall fruit for birds. The flowers of Virginia sweetspire offer nectar for bees, butterflies, and wasps, and the plant’s flaming fall color rivals that of invasive burning bush. The smaller ‘Shamrock’ cultivar of Ilex glabra is a good evergreen shrub. ‘Little Henry’ is the smallest of the cultivars of Itea virginica. Use of vertically-growing native vines such as Lonicera sempervirens (trumpet honeysuckle) can be a space-saving solution. This semi-evergreen vine has a long bloom period, attracting hummingbirds, butterflies, and bees, while its red fruit provides food for birds in the fall. 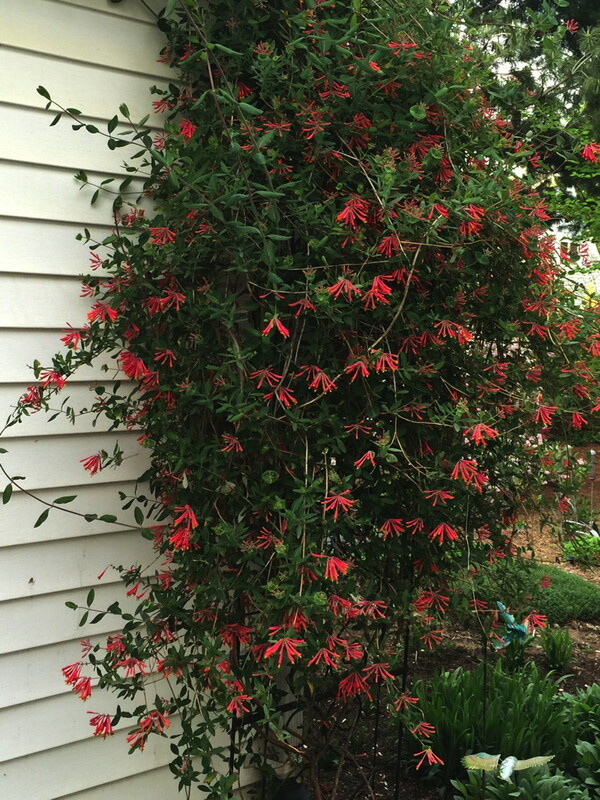 Using vines such as Lonicera sempervirens can save space in smaller gardens. Container gardening is another alternative for gardeners with limited space. Miniature habitats for pollinators can be created in a variety of locations such as window boxes, doorways, steps, decks, patios, balconies, and rooftops. There are special considerations in working with native plants such as the use of perennials rather than summer-blooming annuals. Plantings with native species also rely more on color and texture of foliage for visual interest. Container gardeners can use large stand-alone pots for some of the small tree and shrub species mentioned above or for striking ornamental perennials such as Yucca filamentosa (common yucca) or Adiantum pedatum (maidenhair fern). A themed grouping of containers can be created to attract a single species, such as hummingbirds, with pots of favored red-flowered plants like Aquilegia canadensis (eastern columbine), Lilium canadense (Canada Lily), and Spigelia marilandica (Indian Pink). The Norfolk Botanical garden uses a themed grouping of pots in their hummingbird garden. The ‘Little Woody’ cultivar of Cercis canadensis can be used in a large stand-alone container. Yucca filamentosa is an example of a dramatic plant for a solo pot. Yucca filamentosa is an example of a dramatic plant for a solo pot. Containers of mixed native perennials can also be designed following the familiar formula of “thriller, filler, spiller” for both sun and shade settings. Tall ferns and grasses such as Matteuccia struthiopteris (ostrich fern) and Elymus hystrix (eastern bottlebrush grass) are ideal as thrillers for shade, while Echinacea purpurea (purple coneflower) and Liatris spicata (blazing star) are good choices for sun. Examples of fillers are Heuchera villosa (hairy alumroot) for shade and Penstemon digitalis (beardtongue) for sun. Sedum ternatum (wild stonecrop) and Phlox subulata (moss phlox) are among the many choices for spillers. Mt. Cuba Center uses combinations of native grasses and perennials in large pots throughout the garden. These containers display a variety of interesting foliage textures and colors of ferns and alumroots. MGNV is offering a public education presentation, Small Space Gardening for Pollinators, (on Tuesday, April 2, 7:00-8:30 p.m. at Barrett Branch Library in Alexandria) to share much more about pollinators, the native plants that support them, pollinator-friendly gardening practices, and special container gardening techniques. This topic is so popular that the class is full! Let us know if this is a class we should offer again.. This entry was posted in Balcony/Container Gardening, MG in the Garden, Pollinators, Public Education and tagged bees, beetles, container gardening, hummingbirds, lepidoptera, pollinators, small space gardening, Syrphid flies, understory trees. Bookmark the permalink.